정선화, 박성희,(2013).간호대학생의 스트레스, 우울 및 임상실습만족도와의 관계.재활간호학회지,16(1),47-54. Purpose: The purpose of this study was to investigate the relationship among stress, depression, and satisfaction to clinical practice in nursing students. 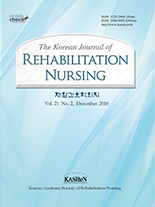 Methods: Three hundred forty-five nursing college students were selected by convenient sampling and data were collected from October to November, 2011. Results: The nursing students experienced moderate stress level. The most severe stressors were adjustment to school and clinical practice. Also, they experienced more than moderate level of satisfaction on clinical practice. The most satisfiable factors were clinical practice circumstance and practice hours. The sophomore had more severe stress and depression and had lower clinical practice satisfaction than the junior. Satisfying with major in nursing as well as clinical practice had a significantly negative correlation with stress and depression. Conclusion: Based on this results, we need to develop programs for increasing satisfaction to clinical practice and major in nursing. The program will enhance adaptation ability to clinical practice.